Thanks to everyone who came out to the Open Gov Hackathon today! We’re proud to announce the winners! The best app using the Tropo API went home with a Sonos Wireless Music System, and the best app using the Geoloqi API went home with an iPad! The judging began at 6:30Pm, and everyone stopped programming. After all of the presentations were done, we discussed each app with the Tropo team and Rick Nixon of CivicApps. It was a tough decision, as the entries were extremely creative and useful! Thanks to everyone who watched, participated, and cheered on the developers. We owe the greatest thanks to Tropo and the City of Portland, who were great supporters of the event. This won’t be the last hackathon. We will be doing this again in the future as soon as possible. If you’re interested in partnering with us for another hackathon, let us know! 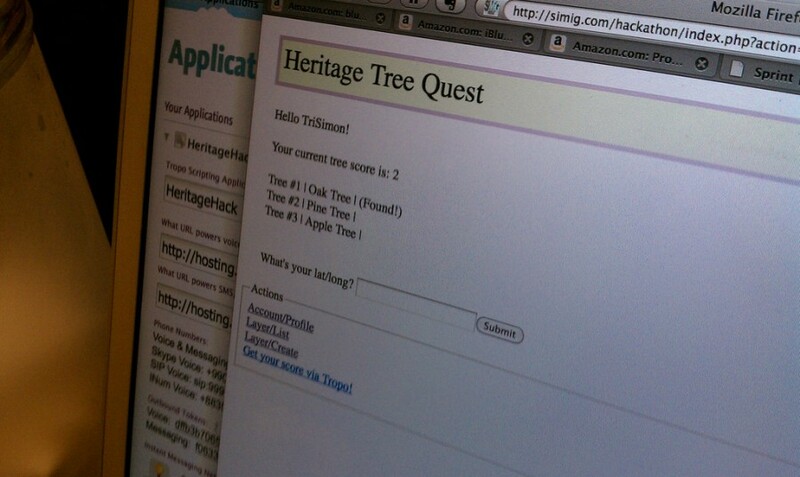 Like PacMan for heritage trees! You go around town finding trees and collecting points. You get bonus points for collecting all trees in a neighborhood. You receive your score via an SMS from Tropo. When you’re near a tree, you can call Tropo and it will quiz you to identify it, getting you even more points! It was this clever use of the voice recognition capabilities of Tropo that made this application stand out. 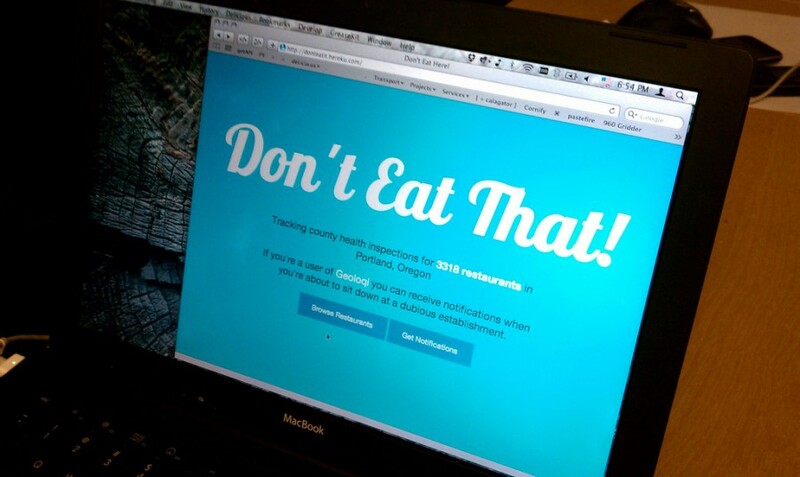 “Don’t Eat That!” pulls health inspections from the county web page. If you use Geoloqi, you can subscribe to notifications of scores under a certain threshold for restaurants within 100 meters of your current location. You’ll get an SMS that says “What ho! You might not want to eat at Backspace, their last inspection score was 93!” That way you can gawk at dirty restaurants near you! 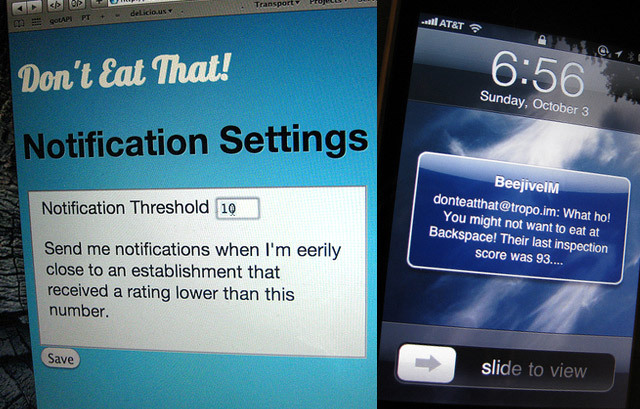 This app will also post links to the reports as tips on Foursquare! Honorable Mention. Finds all the bars in the business license dataset and matches them to Twitter feeds by searching Twitter lists. 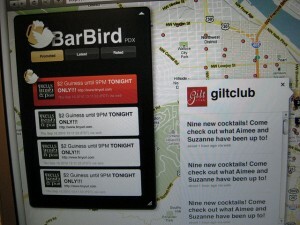 The map shows notification icons on the map and shows the latest tweets from every bar. A future mobile version could use the Geoloqi API to track your location and receive Geonotes for specials at bars near you. Honorable Mention. Finds pets available for adoption from the Multnomah County Animal Services database and petfinder.com. You can read the descriptions of the animals and send out a tweet for them. Using the Tropo API, the non-technical foster homes can call in and ask for a short update about the pet, so the shelters aren’t required to know how to use Twitter. 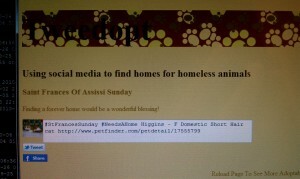 On “Woof Wednesday” the dogs that are looking for homes will tweet their latest updates or a random pet. We are thrilled that everyone was excited to come out and join us for a day of hacking! And special thanks to Tropo for co-sponsoring the event and to CivicApps for the great support.